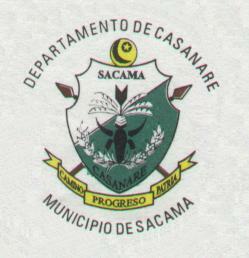 Sácama is a municipality in Casanare Department. Main town is Ninguno. The flag of Sácama is horizontally divided white-red-green and charged with a yellow crescent an 8-points star in the center. "The flag is horizontally divided white-red-green, with respective proportions 2:1:1. White represents peace, hope, prosperity and aspiration to a better future shared by all the inhabitant of the region. Red represents the blood shed by our heroes in their struggle for freedom, and also the energy provided by each farmer in his work and the transfer of his forerunners' legacy to the future generations. Green represents the virgin forests. The small grasslands and the forest resources of the municipality exhibits the fertility of the soil, a land blessed by God and expecting the villagers to work it to get its best fruit and feed their families. The half moon and the star represent the geographic space of the region, the fruit of the land, the human resources and the kindness of the villagers. The eight points of the star represent the eight "veredas" (settlements) forming the municipality. The letter S placed in the middle of the star sand for the name of the municipality." Therefore, the image of the flag seems to be incomplete and should remain so, because the colour of the "S" is not given in the description.